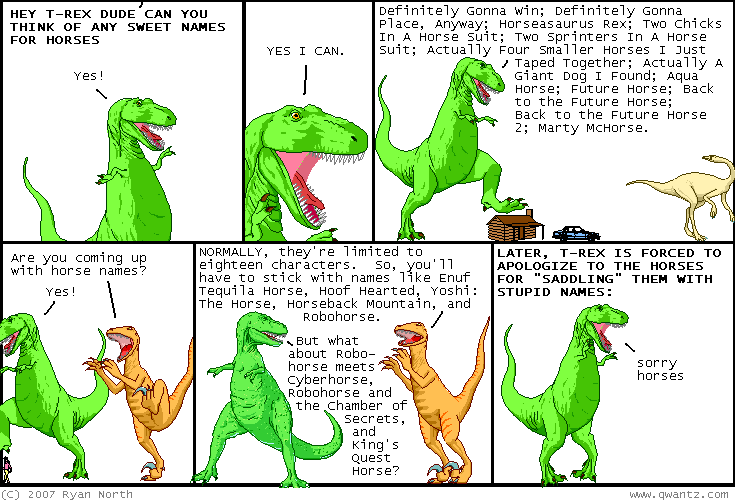 Dinosaur Comics - July 30th, 2007 - awesome fun times! July 30th, 2007: I've been watching the Up Series of movies with my girlfriend and OH MY GOODNESS, am I loving these movies. 7 Up starts with interviewing fourteen British children in 1964 about where they see themselves in the year 2000: their hopes, dreams, what they want to be when they grow up. It was supposed to be a one-shot BBC special, but they went back after seven years to interview them again, and that set the pattern. Every seven years, director Michael Apted goes backs and interviews the children again, so you get 21 Up, 28 Up, 35 Up, 42 Up,and 49 Up, which just came out last year. It's an amazing project on its own (directing a series that will likely last longer than you will must be a crazy feeling) but what makes it work so well is you get to meet this kids, get to feel like you know them, and then in the next movie they're seven years older and so much has changed in their lives. It must be a difficult feeling for the kids at times, knowing that every seven years they get a very public check up on how their lives are going, and there are a few kids who don't participate in one movie or another, probably for just that very reason. I just finished 28 Up last night, and I'm really looking forward to 35 Up tonight. I hope things are going better for Neil. ALSO: don't read that Wikipedia article I linked to past the first two paragraphs or so because there are SPOILERS. Do you call them "spoilers" when it's somebody's life? I guess you do.